Welcome to Fantasy Football Live Match Chat Gameweek 24. We all love a good old midweek schedule. Especially the ‘blink and you’ll miss it’ kind when we have two nights of fixtures that all begin and finish within a couple of hours of intense action. And then we have to take stock, count up our points / injuries and leap / limp onto another new game-week beginning on Saturday. 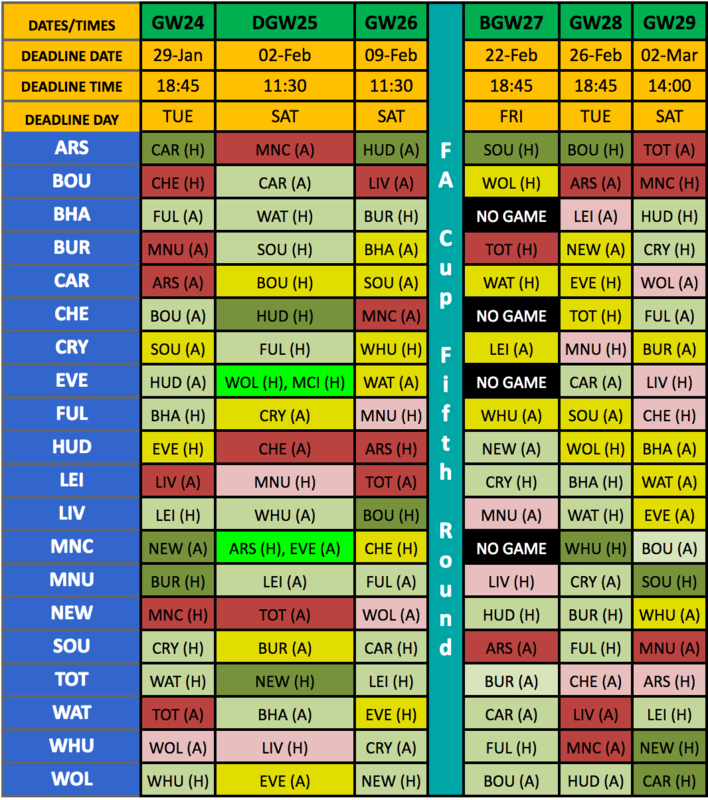 And it looks like a fairly good spread over both nights in terms of fantasy interest, none of this 4 mid-table clashes on a Saturday afternoon nonsense, as all the interesting ones play out on TV elsewhere. Tuesday sees us with no less than 6 games as Arsenal (and Aubayeyang owners particularly) will be hoping for a spanking of Cardiff, Fulham desperately need a result against a Brighton team who don’t particularly need one themselves, but usually prove to frustrate those who do, Huddersfield look to add another nail to Marco Silva’s Everton coffin, which he seems quite content on constructing himself, Wolves and West Ham battle to see which one will be Jekyll and which one Hyde this week, Ole continues his live job interview at home to Burnley, and Newcastle look to frustrate Pep, probably in vain. 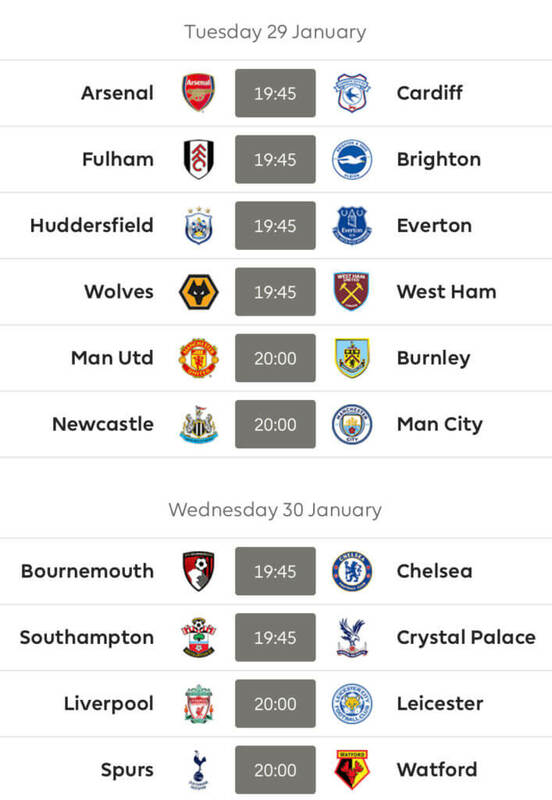 Wednesday is equally intriguing as Sarri takes a fractured / newly motivated* team (*delete as you see applicable) to Bournemouth, Saints and Palace hope to put more / some daylight between each other, Liverpool look to continue their title charge against Leicester and Spurs hope they can field 11 fit players against Watford. Good luck to absolutely everyone for Gameweek 24 from all at FF247! Thanks for reading Fantasy Football Live Match Chat Gameweek 24. Today has really demoralised me. I thought I could do an easy Haz -> Sterling for the dgw but now I’ve got a ban and three potential injuries to consider. I read Arnau should be ok & Pog to miss1, so keep if you can. Change Tomkins? Why does everyone want to replace Digne with 1 blank(27)? He got only 1 match ban (i.e. will play Gw25 as SGW vs City) and there are not too many defenders around who are doing well either. Will Baines permanently replace him? I doubt that – if Rich plays in LW and Tosun on top, then Baines can play. But if Rich goes top, Bernard in LW, then Digne has a good combination with Bernard or, even can replace him in LW. I suppose Doherty, cheaper, and with more points, lurks in the background at a similar price. It’s a good point. Personally I need to raise 0.2 that’s why I think I’ll be getting rid plus their fixtures are not very good.